The electropumps of the HYDRO series are designed for draining clear, turbid and yard waters. This electric submersible pumps are equipped with a filter with maximum passage of solid bodies established by the width of the slits. Suitable both for civil and industrial use, their versatility makes them suitable for many applications. They can be used as portable pumps ready for use for fixed installations. 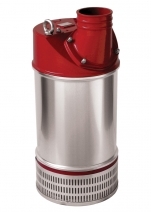 Depending on the model, the Hydro submersible electropumps, may have a discharge outlet Gas thread or smooth for the connection of a hose, engine oil bath or dry chamber, double mechanical seal, stainless steel shaft and built-in protection against overheating. For the toughest jobs, hydraulic parts subject to wear, of every electropump, are coated with rubber with the ability to be adjusted to maintain the hydraulic characteristics unchanged. Some versions also available for hydraulic high heads since the smaller powers. 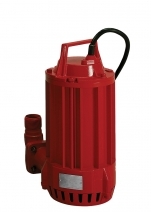 Submersible electric pumps suitable for the lifting of clear and dirty water. They are especially used in building yards and for pumping abrasive liquids. This is a high head pump.